We’re going to progressively enhance the app as we learn, starting from something very simple and eventually winding up with something that could be released on the app store. Note that I’m not a designer, and the app probably won’t look all that pretty. Them’s the breaks. This time, we’re going to build on a previous project. You can get the source I’m using as a starting point for this tutorial from Github BuildMobile Project Orny. The source for the app as it exists at the end of this tutorial will be made available on a separate branch in due course. Download the archive, unzip it, and open it in Xcode. In our previous tutorial, we implemented a UITableView to show a list of birds. We now want to make this table interactive, so that clicking on the name of a bird will show a picture of it. Before we go too far though, we should neaten up one aspect of our previous code. The key here is the use of dequeueReusableCellWithIdentifier to get any “spare” cells. If there’s a cell sitting off-screen, not being displayed, we get a handle to that and “edit” it to be the cell we want. If none are spare, that method returns nil, and we create a brand new cell. For this to work, all cells in a given table must use the same identifier (hence the use of @"birdList" in [[UITableViewCell alloc] initWithStyle]). Bear this in mind for any future use of this technique. Much better! We now want to make our table rows clickable. When clicked, we’ll show the user an image of the bird selected (with some attribution text explaining where the image came from). We’ve got the method in place – now we need to wire our UITableView to use our controller as a delegate. 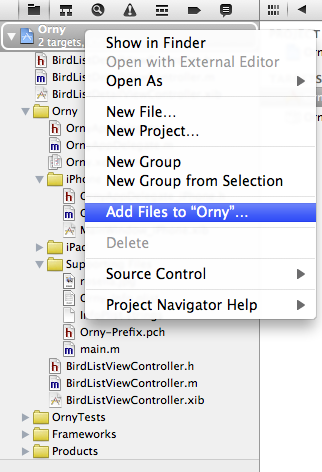 Open BirdListViewController.xib, and right-click the UITableView. Drag-and-draw from the circle to the right of the word ‘delegate’ to the ‘File’s Owner’ box on the left. Yippee-kai-ay: Build and run, and you should see an alert pop up when you click on a table cell. We’re now going to add a view for displaying images of our bird species. When the user selects a row in the table, instead of showing an alert, we’ll transition to the new view and display the image. When you drag in the image view and hold it there a moment, you should find it resizes to take over the entire space of the view. Neat! We now want to connect our BirdListDetailViewController to the UIImageView in the XIB file. We need to create a ‘handle’ to the UIImageView in the controller, and attach the UIImageView to the controller in the XIB file. 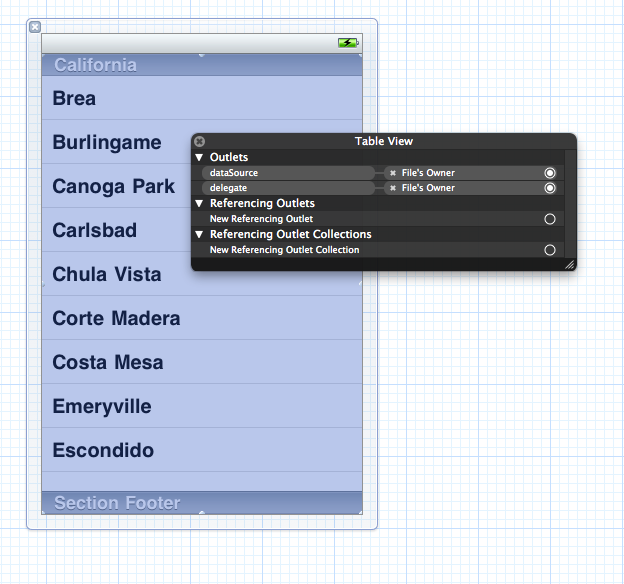 We do this by creating a property on the controller called an IBOutlet (Interface Builder Outlet). 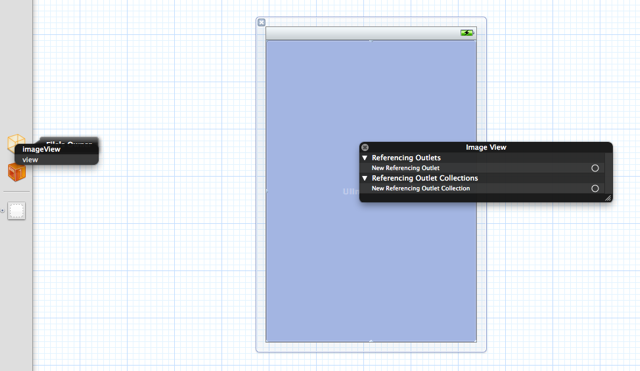 Switch over to the XIB, and right-click your UIImageView. You should see the usual right-click menu; drag-and-draw a line from ‘New Referencing Outlet’ to the ‘File Owner’ icon on the left. Your controller is now aware of the existence of the UIImageView in your View (the XIB file). You don’t need to do this for every element – just the ones you want to interact with at run-time. At the time of writing, both of these images were released under a Creative Commons license. In the case of the image of the Rosella by Flickr user symonty, the image is licensed under the Creative Commons Attribution No Derivatives license (CC-BY-ND) – we can use it, as long as we acknowledge the author and don’t change the image. In the case of the Magpie image by Flick user teknorat, the license is Creative Commons Attribution Share Alike (CC-BY-SA) – we can use the image as long as we attribute the author, and share any derivatives of his work we make under the same license. In either case, this means that if you plan to release an application using these resources to the public, you will need to include information on or around the image as to its origin, per the terms of the licenses these content authors have chosen. Select the files, make sure ‘Copy items into destination group’s folder (if needed)’ is checked, and click ‘Add’. If they’re not already, drag-and-drop the images into ‘Supporting Files’. This is not an essential step, but it’s good to keep things organised. We’ll need these images in just a moment. We’ll use a UINavigationController to push views onto a stack, display them to the user, and control transitions (via buttons controls) back to the main screen. This means we need to rewire our MainWindow_iPhone.xib and MainWindow_iPad.xib. Both of these files contain a Window and a View, with the View set to be the RootViewController of the Window. Go into each file, and delete the View object (you can select it on the left, then hit delete to remove it). Find the Navigation Controller in the object panel, and drag it into the XIB file. Finally, select the Properties view, and change the ‘Custom Class’ of the Navigation Controller to be BirdListViewContoller. Now, when your application starts, our BirdListViewController‘s view will be placed inside the UINavigationController by default. Earlier we wrote a function to handle the case where a user clicks on a table row. We want to re-write this function to instead initialise a BirdListDetailViewController, tell it which image to load, and pop it onto the UINavigationController. This will present it to the user, with a ‘back’ button to come back to our main screen. However, we need to be particular about the order in which these operations happen, and how we handle them. The BirdListDetailViewController will be initialised first, but its view won’t be ‘awoken’ from its XIB (or, in older parlance, NIB) file until the UINavigationController pushes the view into the user’s sight. It’s a tortured Theophilus Thistler reference. Look it up on YouTube. When the user clicks on a row, we want to ‘push’ the view onto the UINavigationController that is now the root view of our application. 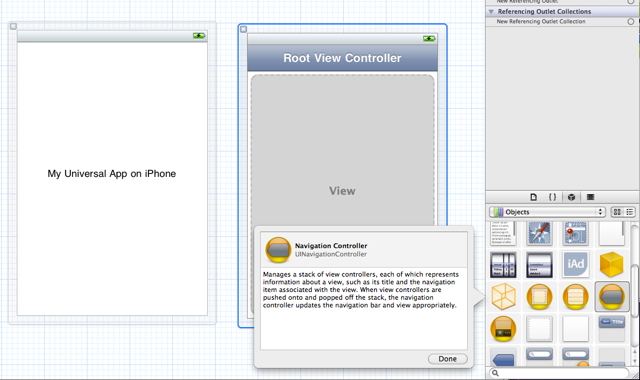 By default, all views added to a UINavigationController have a property set on them called navigationController. In an earlier tutorial, we set up a data structure consisting of arrays and dictionaries to hold information about the bird species we’re listing to the user. Unfortunately, the earlier tutorial included full filename in that data structure. If you hit run, you should now see images when you click on the names of birds. This week, I’ll leave you with a few challenges. How can you change the title of the root view controller from “Root View Controller”? How can you change the back button on the BirdListDetailViewController? How would you go about changing the project to work with different file formats? What are some methods we can use to add more bird species to our table, without having to specify them manually in loadBirdData? We’ve made our app significantly more interactive, and users can now see images of some of the bird species we’re listing. Next time, we’ll expand the application further by pulling bird species data in from a CoreData database!